Anderson Valley seems remote because it is remote. As the crow flies Anderson Valley is roughly two and a half hours north of San Francisco and once you exit the 101 freeway in Cloverdale onto state route 128 get ready for the beautiful bucolic scenery. You won't see any billboards, strip malls, seven elevens or fast food chains until you get back to Highway 101 or when you reach Fort Bragg off the coast on Highway 1. The twenty-eight mile serpentine roadway running from Cloverdale to Booneville is a motorcycle and sports car enthusiast dream. The town of Booneville, population 1,035 is located in the center of the valley. Booneville is the hub of Anderson Valley and is where most of the activity and population rest. In the past the main source of commerce for the valley was logging, but that industry has all but vanished. The valley's main industries are now all centered around agriculture ( apples, beer, wine and marijuana ). As of the 2010 census the total vineyard bearing acres in Anderson Valley was 2,244 with Pinot Noir at 1,453 acres being roughly 65% of that total. Consider for a little perspective that Napa County has eighteen times as much area under vine with 43,500 vineyard bearing acres. In Anderson Valley Chardonnay planted is at 500 acres and Gewurztraminer accounts for 85 acres. As one could surmise Pinot Noir plantings are on the rise and interestingly Chardonnay and Gewurztraminer are two varietals that are on the decline in Anderson Valley. The valley is ten miles from the Pacific Ocean and is about a half to one and a half miles wide and fifteen miles long. At 30 degrees latitude it's one of the coolest places to grow grapes in California with an average annual temperature of about 53 degrees fahrenheit. We'd like to thank Janis MacDonald who serves as the Executive Director for the AVWA and Meg Murray for inviting us to this wonderful event and for their warm and ingratiating welcome when we arrived. 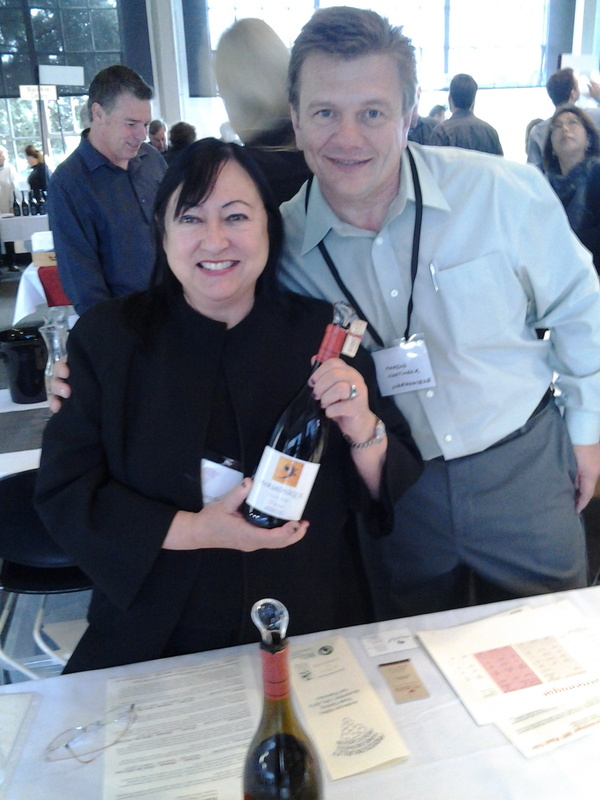 AVWA also host the International Alsace Varietal Festival in February and the Anderson Valley Pinot Noir Festival in May. A majority of the wineries on hand produce wine in the hundreds not thousands of cases making these wines more challenging to find. You won't come across them at a big discounter in the market place. Several producers only offer their products via a mailing list which means you'll have to sign up and wait for an opening before you can buy their wines. Also due to its remoteness some vintners source their grapes from within Anderson Valley but have their winemaking facilities set up in more urban areas. The tasting was from 11 am to 3 pm, which provided plenty of time for us to taste and chat with the twenty-nine producers that were there. The overall feel of the gathering was relaxed, casual and informative. Many of the principals representing the wineries were the winemakers themselves. It was refreshing to not get the standard verbal rote one hears at larger well established tasting from winery representatives. Most producers were very engaging and seemed genuinely interested in telling the story of their businesses and their wines. It's always a bit of a double edged sword to generalize about a regions wines but here goes. Anderson Valley Pinot Noir from the 2011 vintage exhibit bright red fruits ( cranberries, cherries, raspberries and plums ), medium bodied weight, with a strong emphasis on aromatics and energy. This profile can be accented or dwarfed by the actions of the winemaker i.e. less or more time in oak barrels. All in all we found the wines to be very approachable and easy to drink. One would have to look back to the 1982 and 1983 vintages to find a harvest on the north coast of California as challenging for grape growers and winemakers. 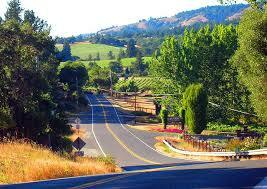 In Anderson Valley the spring was cool and wet which delayed the growing cycle for the vines. Spring was followed by a cool summer. As harvest approached in October the first of a series of rainstorms came. When grapes get wet they tend to attract mold and rot. Moldy and rotten grapes are not the best material for making good wines. Growers that picked before the rains may not have gotten the extra sugar in their grapes to produce richer bodied wines but they probably slept pretty well once the rains started, knowing that their grapes were safely fermenting in the winery cellars. Some vintners waited for the weather to clear in late October and were rewarded, while others did not fare so well.&nbsp; 2011 was a vintage from a weather standpoint that most vintners would like to forget. Being a Sonoma County resident and having lived through the 2011 summer that never was I brought my own prejudices to the tasting. The words of a noted wine retailer " I'm not buying any 2011 Pinot Noir. I'm waiting for the 2012's" haunted my every swirl of the wine glass. Fortunately my nose triumphed over my prejudgments and I was able to enjoy tasting some very fine examples of Pinot Noir, Chardonnay, Gewurztraminer and Pinot Gris. There were a number of wines we did not try because we were already familiar with them so they are not on our listing. Most noteworthy of those are La Crema Winery, Roederer Estate and Scharffenberger Cellars. Listed below in three categories and alphabetical order are our recommendations. Don't be disappointed if you can't find some of the wines we recommended, but make sure you catch the next wave of releases from the new vintage (2012) which will start coming on line this spring. If Anderson Valley winemakers can offer wines this charming and approachable from the 2011 harvest the 2012 wines ought to be something we should all be looking forward to enjoying as well. After meeting most of the presenters at the event we got the impression that the Anderson Valley growers and winemakers were a close-knit group as they help each other in business matters and spend time together as friends outside of work. Here's a few people we met at the show that made a lasting impression on us.